Application - Core application class. An Application is the foundation of an application, unique for a given application identifier. The Application class wraps some low-level platform-specific services and is intended to act as the foundation for higher-level application classes such as Gtk::Application or MxApplication. In general, you should not use this class outside of a higher level framework. One of the core features that Application provides is process uniqueness, in the context of a "session". The session concept is platform-dependent, but corresponds roughly to a graphical desktop login. When your application is launched again, its arguments are passed through platform communication to the already running program. The already running instance of the program is called the primary instance. Before using Application, you must choose an "application identifier". The expected form of an application identifier is very close to that of of a DBus bus name. Examples include: "com.example.MyApp", "org.example.internal-apps.Calculator". For details on valid application identifiers, see id_is_valid(). Application provides convenient life cycle management by maintaining a use count for the primary application instance. The use count can be changed using hold() and release(). If it drops to zero, the application exits. 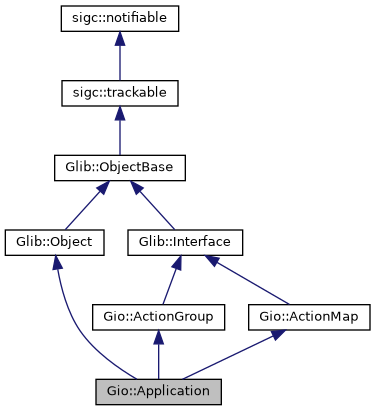 Application also implements the ActionGroup and ActionMap interfaces and lets you easily export actions by adding them with Gio::ActionMap::add_action(). When invoking an action by calling Gio::ActionGroup::activate_action() on the application, it is always invoked in the primary instance. The signal_startup() signal lets you handle the application initialization for all of these in a single place. See the C API docs for an example. If no application ID is given then some features (most notably application uniqueness) will be disabled. In essence, this results in the Application::signal_activate() signal being emitted in the primary instance. Adds a main option entry to be handled by the Application. This function is comparable to Glib::OptionGroup::add_entry() + Glib::OptionContext::set_main_group(). After the commandline arguments are parsed, the signal_handle_local_options() signal will be emitted. At this point, the application can inspect the parsed values. Unlike OptionGroup + OptionContext, Application packs the arguments into a Glib::VariantDict which is passed to the signal_handle_local_options() handler, where it can be inspected and modified. If Gio::Application::Flags::HANDLES_COMMAND_LINE is set, then the resulting dictionary is sent to the primary instance, where Gio::ApplicationCommandLine::get_options_dict() will return it. This "packing" is done according to the type of the argument – booleans for normal flags, Glib::ustring's for strings, std::string's for filenames, etc. The packing only occurs if the flag is given (ie: we do not pack a "false" Variant in the case that a flag is missing). In general, it is recommended that all commandline arguments are parsed locally. The options dictionary should then be used to transmit the result of the parsing to the primary instance, where Glib::VariantDict::lookup_value() can be used. For local options, it is possible to consult (and potentially remove) the option from the options dictionary. This function is new in GLib 2.40. Before then, the only real choice was to send all of the commandline arguments (options and all) to the primary instance for handling. Application ignored them completely on the local side. Calling this function "opts in" to the new behaviour, and in particular, means that unrecognised options will be treated as errors. Unrecognised options have never been ignored when Gio::Application::Flags::HANDLES_COMMAND_LINE is unset. If signal_handle_local_options() needs to see the list of filenames, then the use of G_OPTION_REMAINING as long_name is recommended. G_OPTION_REMAINING can be used as a key into the options dictionary. If you do use G_OPTION_REMAINING then you need to handle these arguments for yourself because once they are consumed, they will no longer be visible to the default handling (which treats them as filenames to be opened). long_name The long name of an option can be used to specify it in a commandline as --long_name. Every option must have a long name. short_name If an option has a short name, it can be specified -short_name in a commandline. short_name must be a printable ASCII character different from '-', or '\0' if the option has no short name. description The description for the option in --help output. arg_description The placeholder to use for the extra argument parsed by the option in --help output. flags Flags from Glib::OptionEntry::Flags. Do not set OptionEntry::Flags::FILENAME. Character encoding is chosen with arg_type. Adds a string option entry, but lets the callback slot parse the extra argument instead of having it packed in a Glib::VariantDict. If you create more than one Application instance (unusual), one Application instance can't add an option with the same name as another instance adds. This restriction does not apply to the add_main_option_entry() that takes an OptionType parameter. Adds a filename option entry, but lets the callback slot parse the extra argument instead of having it packed in a Glib::VariantDict. Gets the Gio::DBus::Connection being used by the application, or nullptr. If Application is using its D-Bus backend then this function will return the Gio::DBus::Connection being used for uniqueness and communication with the desktop environment and other instances of the application. If Application is not using D-Bus then this function will return nullptr. This includes the situation where the D-Bus backend would normally be in use but we were unable to connect to the bus. This function must not be called before the application has been registered. See g_application_get_is_registered(). Gets the D-Bus object path being used by the application, or nullptr. The object path, or nullptr. Returns the default Application instance for this process. Normally there is only one Application per process and it becomes the default when it is created. You can exercise more control over this by using g_application_set_default(). If there is no default application then nullptr is returned. The default application for this process, or nullptr. Gets the flags for application. Gets the unique identifier for application. The identifier for application, owned by application. This is the amount of time (in milliseconds) after the last call to g_application_release() before the application stops running. Gets the application's current busy state, as set through g_application_mark_busy() or g_application_bind_busy_property(). true if application is currenty marked as busy. Gets the resource base path of application. See g_application_set_resource_base_path() for more information. The base resource path, if one is set. Increases the use count of application. Use this function to indicate that the application has a reason to continue to run. For example, g_application_hold() is called by GTK+ when a toplevel window is on the screen. To cancel the hold, call g_application_release(). A valid ID is required for calls to g_application_new() and g_application_set_application_id(). Note that the hyphen (-) character is allowed in application identifiers, but is problematic or not allowed in various specifications and APIs that refer to D-Bus, such as Flatpak application IDs, the DBusActivatable interface in the Desktop Entry Specification, and the convention that an application's "main" interface and object path resemble its application identifier and bus name. To avoid situations that require special-case handling, it is recommended that new application identifiers consistently replace hyphens with underscores. As with D-Bus interface names, if the author's DNS domain name contains hyphen/minus characters they should be replaced by underscores, and if it contains leading digits they should be escaped by prepending an underscore. For example, if the owner of 7-zip.org used an application identifier for an archiving application, it might be named org._7_zip.Archiver. application_id A potential application identifier. true if application_id is valid. Checks if application is registered. An application is registered if g_application_register() has been successfully called. true if application is registered. Checks if application is remote. If application is remote then it means that another instance of application already exists (the 'primary' instance). Calls to perform actions on application will result in the actions being performed by the primary instance. The value of this property cannot be accessed before g_application_register() has been called. See g_application_get_is_registered(). true if application is remote. Increases the busy count of application. To cancel the busy indication, use g_application_unmark_busy(). This is a default handler for the signal signal_activate(). This is a default handler for the signal signal_command_line(). This is a default handler for the signal signal_handle_local_options(). This is a default handler for the signal signal_name_lost(). This is a default handler for the signal signal_shutdown(). This is a default handler for the signal signal_startup(). The unique identifier for the application. Flags specifying the behaviour of the application. Time (ms) to stay alive after becoming idle. Whether the application is currently marked as busy through g_application_mark_busy() or g_application_bind_busy_property(). If g_application_register() has been called. If this application instance is remote. The base resource path for the application. Upon return to the mainloop, g_application_run() will return, calling only the 'shutdown' function before doing so. The result of calling g_application_run() again after it returns is unspecified. If there is no application ID or if Gio::Application::Flags::NON_UNIQUE was given, then this process will always become the primary instance. The Application::signal_startup() signal is emitted if registration succeeds and application is the primary instance (including the non-unique case). the return value of this function is not an indicator that this instance is or is not the primary instance of the application. See g_application_get_is_remote() for that. Decrease the use count of application. Never call this function except to cancel the effect of a previous call to g_application_hold(). This function is intended to be run from main() and its return value is intended to be returned by main(). Although you are expected to pass the argc, argv parameters from main() to this function, it is possible to pass nullptr if argv is not available or commandline handling is not required. Note that on Windows, argc and argv are ignored, and Glib::win32_get_command_line() is called internally (for proper support of Unicode commandline arguments). Application will attempt to parse the commandline arguments. You can add commandline flags to the list of recognised options by way of g_application_add_main_option_entries(). After this, the Application::signal_handle_local_options() signal is emitted, from which the application can inspect the values of its OptionEntrys. Application::signal_handle_local_options() is a good place to handle options such as --version, where an immediate reply from the local process is desired (instead of communicating with an already-running instance). A Application::signal_handle_local_options() handler can stop further processing by returning a non-negative value, which then becomes the exit status of the process. What happens next depends on the flags: if Gio::Application::Flags::HANDLES_COMMAND_LINE was specified then the remaining commandline arguments are sent to the primary instance, where a Application::signal_command_line() signal is emitted. Otherwise, the remaining commandline arguments are assumed to be a list of files. If there are no files listed, the application is activated via the Application::signal_activate() signal. If there are one or more files, and Gio::Application::Flags::HANDLES_OPEN was specified then the files are opened via the Application::signal_open() signal. If you are interested in doing more complicated local handling of the commandline then you should implement your own Application subclass and override local_command_line(). In this case, you most likely want to return true from your local_command_line() implementation to suppress the default handling. See [gapplication-example-cmdline2.c][gapplication-example-cmdline2] for an example. If the Gio::Application::Flags::IS_SERVICE flag is set, then the service will run for as much as 10 seconds with a use count of zero while waiting for the message that caused the activation to arrive. After that, if the use count falls to zero the application will exit immediately, except in the case that g_application_set_inactivity_timeout() is in use. This function sets the prgname (Glib::set_prgname()), if not already set, to the basename of argv. Much like Glib::main_loop_run(), this function will acquire the main context for the duration that the application is running. Since 2.40, applications that are not explicitly flagged as services or launchers (ie: neither Gio::Application::Flags::IS_SERVICE or Gio::Application::Flags::IS_LAUNCHER are given as flags) will check (from the default handler for local_command_line) if "--gapplication-service" was given in the command line. If this flag is present then normal commandline processing is interrupted and the Gio::Application::Flags::IS_SERVICE flag is set. This provides a "compromise" solution whereby running an application directly from the commandline will invoke it in the normal way (which can be useful for debugging) while still allowing applications to be D-Bus activated in service mode. The D-Bus service file should invoke the executable with "--gapplication-service" as the sole commandline argument. This approach is suitable for use by most graphical applications but should not be used from applications like editors that need precise control over when processes invoked via the commandline will exit and what their exit status will be. argc The argc from main() (or 0 if argv is nullptr). argv The argv from main(), or nullptr. Sends a notification on behalf of application to the desktop shell. There is no guarantee that the notification is displayed immediately, or even at all. id may be nullptr, but it is impossible to replace or withdraw notifications without an id. If notification is no longer relevant, it can be withdrawn with g_application_withdraw_notification(). id Id of the notification, or nullptr. notification The Notification to send. Sets or unsets the default application for the process, as returned by g_application_get_default(). This function does not take its own reference on application. If application is destroyed then the default application will revert back to nullptr. application The application to set as default, or nullptr. Sets the flags for application. The flags can only be modified if application has not yet been registered. flags The flags for application. Sets the unique identifier for application. The application id can only be modified if application has not yet been registered. If non-nullptr, the application id must be valid. See g_application_id_is_valid(). application_id The identifier for application. This call has no side effects of its own. The value set here is only used for next time g_application_release() drops the use count to zero. Any timeouts currently in progress are not impacted. inactivity_timeout The timeout, in milliseconds. Adds a description to the application option context. See Glib::option_context_set_description() for more information. description A string to be shown in --help output after the list of options, or nullptr. Sets the parameter string to be used by the commandline handling of application. This function registers the argument to be passed to Glib::option_context_new() when the internal OptionContext of application is created. See Glib::option_context_new() for more information about parameter_string. parameter_string A string which is displayed in the first line of --help output, after the usage summary programname [OPTION...]. Adds a summary to the application option context. See Glib::option_context_set_summary() for more information. summary A string to be shown in --help output before the list of options, or nullptr. Sets (or unsets) the base resource path of application. As an example, if the application has an ID of "org.example.app" then the default resource base path will be "/org/example/app". If this is a Gtk::Application (and you have not manually changed the path) then Gtk will then search for the menus of the application at "/org/example/app/gtk/menus.ui". You can disable automatic resource loading functionality by setting the path to nullptr. Changing the resource base path once the application is running is not recommended. The point at which the resource path is consulted for forming paths for various purposes is unspecified. When writing a sub-class of Application you should either set the Application::property_resource_base_path() property at construction time, or call this function during the instance initialization. Alternatively, you can call this function in the ApplicationClass.startup virtual function, before chaining up to the parent implementation. resource_path The resource path to use. The signal_activate() signal is emitted on the primary instance when an activation occurs. See g_application_activate(). The signal_command_line() signal is emitted on the primary instance when a commandline is not handled locally. See g_application_run() and the ApplicationCommandLine documentation for more information. command_line A ApplicationCommandLine representing the passed commandline. An integer that is set as the exit status for the calling process. See g_application_command_line_set_exit_status(). The signal_handle_local_options() signal is emitted on the local instance after the parsing of the commandline options has occurred. You can add options to be recognised during commandline option parsing using g_application_add_main_option_entries() and g_application_add_option_group(). Signal handlers can inspect options (along with values pointed to from the arg_data of an installed OptionEntrys) in order to decide to perform certain actions, including direct local handling (which may be useful for options like –version). In the event that the application is marked Gio::Application::Flags::HANDLES_COMMAND_LINE the "normal processing" will send the options dictionary to the primary instance where it can be read with g_application_command_line_get_options_dict(). The signal handler can modify the dictionary before returning, and the modified dictionary will be sent. In the event that Gio::Application::Flags::HANDLES_COMMAND_LINE is not set, "normal processing" will treat the remaining uncollected command line arguments as filenames or URIs. If there are no arguments, the application is activated by g_application_activate(). One or more arguments results in a call to g_application_open(). If you want to handle the local commandline arguments for yourself by converting them to calls to g_application_open() or g_action_group_activate_action() then you must be sure to register the application first. You should probably not call g_application_activate() for yourself, however: just return -1 and allow the default handler to do it for you. This will ensure that the --gapplication-service switch works properly (i.e. no activation in that case). Note that this signal is emitted from the default implementation of local_command_line(). If you override that function and don't chain up then this signal will never be emitted. The signal_name_lost() signal is emitted only on the registered primary instance when a new instance has taken over. This can only happen if the application is using the Gio::Application::Flags::ALLOW_REPLACEMENT flag. The default handler for this signal calls g_application_quit(). true if the signal has been handled. The signal_shutdown() signal is emitted only on the registered primary instance immediately after the main loop terminates. The signal_startup() signal is emitted on the primary instance immediately after registration. See g_application_register(). Decreases the busy count of application. This function must only be called to cancel the effect of a previous call to g_application_mark_busy(). Unsets any existing default application. Disable automatic resource loading functionality. Withdraws a notification that was sent with g_application_send_notification(). id Id of a previously sent notification.